The bridal bouquet is more than a bunch of flowers that you carry down the aisle or use as a prop for your wedding photos. It’s a living, breathing symbol of a fresh start—the beginning of a beautiful, happy and exciting new chapter in your life with your loved one. That’s why picking the right arrangement is one of the most important decisions a bride has to make. But sometimes, finding a bride bouquet with the right size, shape, colors and flowers to match your wedding-day style is no easy task. Need some help making sure your wedding flowers are a match made in heaven for your big day? Here are a few tips from the pros on how to choose a bridal bouquet that’s perfect for you and your wedding. Teardrop: The teardrop bouquet is round at the top and pointed at the bottom, like an inverted droplet. It’s a great match for brides who are shorter in stature, since it creates the illusion of length. On the flipside, it’s also a good option for taller brides since it draws the eye downward and takes the focus away from your height. But because of its tendency to put the focus on the bottom half of your body, this arrangement should be avoided by pear-shaped brides. Cascading: This bouquet is round at the top and has a waterfall of flowers that flows out from the bottom and over the bride’s hands. It works well for brides who have a full figure or a large, extravagant gown. But be careful: If all the beautiful details are in the skirt of your gown, you might want to steer clear of this bouquet shape since you don’t want to hide them. But if you have a long, dramatic train at the back of your dress, the cascade bouquet balances out the look quite nicely. Nosegay: Small, round and compact, these arrangements are the perfect way to add some height to a bride who is on the shorter side. But if you have a taller or wider figure, this tiny bouquet will only make you look bigger than you actually are, so opt for a larger arrangement instead. Round: In a round bouquet, the flowers are arranged in the shape of a ball. Its circular shape harmonizes well with tall, slim brides with straight-lined dresses. It’s probably not the best choice if you have a rounder figure, however, because this bouquet will only accentuate your curves. Arm Sheath: Finally, this long-stemmed bouquet is meant to be cradled in the crook of your arm like a baby. This is another great option for taller brides, since its length will detract from your height. It’s not a good pick, however, for shorter brides. Its big size will look too heavy and overbearing for anyone with a small build. So the rule of thumb is: Taller, more full-figure brides should stick to larger bouquets; shorter, more petite brides should go for smaller ones. But there’s also one other thing to keep in mind when deciding between small bridal bouquets versus large bridal bouquets: “Brides should also consider their budget when choosing the size of their bouquets,” says Fleegal. “The size of the bouquet is directly related to the expense.” So the bigger the arrangement, the more you’ll pay for it. If you have a tight financial plan, you may not want to go overboard when selecting a large bouquet. Plus, make sure your bouquet is comfortable to hold! You don’t want your wedding-day blooms to make you hunch or tip over. So your florist can better help you choose a bridal bouquet shape and size that matches your figure and your wedding dress, make sure you show them lots of pictures during your first consultation. “We recommend brides prepare a virtual vision board with a collection of photos that they find appealing. Brides can also review bridal magazines, wedding websites, Pinterest and other social media sites to assist with the look that they envision for their wedding. This is very helpful during the consultation process. We also discuss the style and color of a bride’s dress during her consultation, so a bride should supply a photo of her dress as well,” says Fleegal. And so we move on to the next step in the bouquet selection process: Picking out your favorite colors and flowers! Already having your wedding dress and bridesmaids dresses picked out makes this part a lot easier on you. Wedding dresses come in many shades of white—and some of them even have accent colors—so if you know what you and your ladies will be wearing, then you’ll know what complementary colors to choose in order to make your flowers pop. Again, remember to bring photos of the wedding dress and the bridesmaids dresses. If you have swatches, those will be even more helpful to your florist. Although you can go with pretty much any color theme your heart desires, there are still some color pitfalls you’ll want to avoid. First, a solid white bridal bouquet held against a white wedding dress may not photograph well. So if you’re leaning toward a white bouquet, consider adding an accent color or some greenery to make the arrangement stand out in photos. Dark colors are also tricky: “We recommend avoiding receding colors, since they can appear as ‘holes’ in photos. Dark purple and dark blue would be an example of this,” says Fleegal. 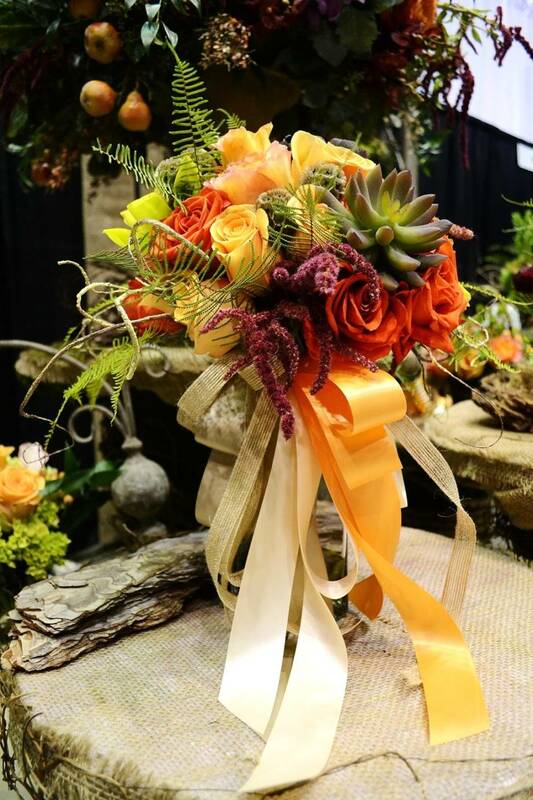 Don’t forget that you can also bring your own personal touch to every bouquet your florist shows you. “Many brides will add a brooch, pin or locket that has significance to their life,” says Fleegal. “Some brides choose to wrap their bouquet in lace from their mothers’ wedding gowns or add a specific flower that symbolizes a lost loved one.” For a bridal bouquet with even more personality, accent it with some items that say something about you, like seashells (if you’re a beach lover) or golf tees (if you love playing a few rounds on the big green). It’s your shining moment, so be yourself! So now that you know how to choose a bridal bouquet that’s the perfect match for your wedding day, it’s time to start your beautiful new life with the person who’s the perfect match for you!